In the early 20th century, vicious Parisian gang members calling themselves The Apaches were all but uncontrollable. The fighting system called Defense Dans La Rue – created specifically to combat these thugs by developing techniques more brutal than the criminals could think of – turned the tide against them. 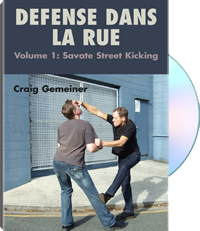 In this video, instructor Craig Gemeinerr presents a detailed breakdown of the savate street-kicking techniques of this combat system, combining it with conditioning exercises and modern pressure drills tailored to the needs of anyone interested in personal defense. There are no high kicks and martial-artsy techniques here: this is a fighting system for real-world combat. For information purposes only.